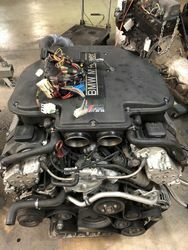 Up for auction is the legendary BMW S62 Engine found in the E39 M5 and the BMW Z8. Includes all the accessories including headers. The engine wiring harness, engine dme, and air boxes are included. Bmw e39 530i motor sport 2001 model white colour, 18 inch mag, black leather int.